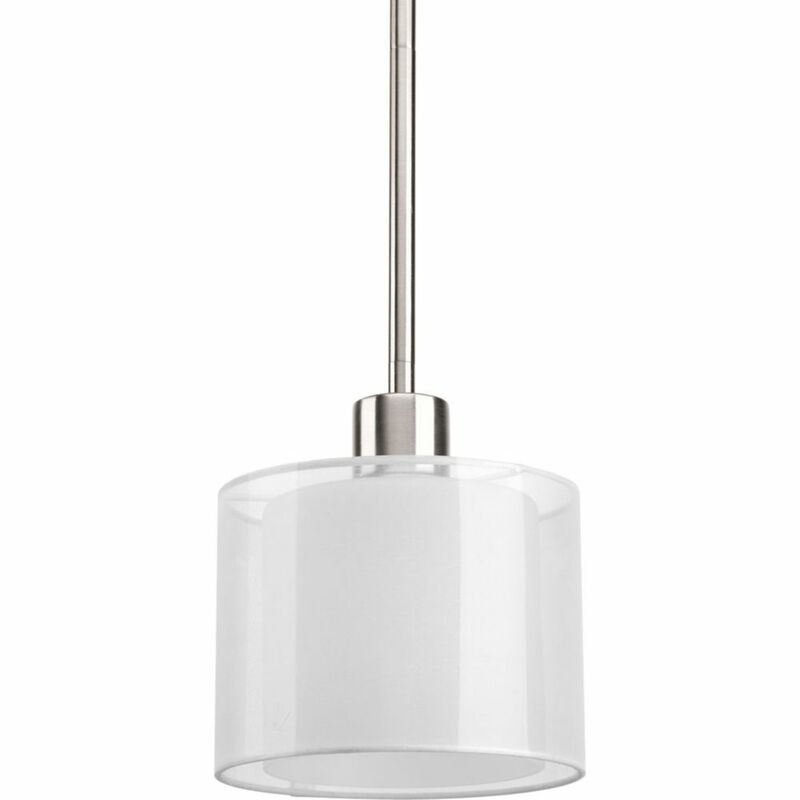 Caress features a chic, sophisticated polished metal frame with layered glass diffusers to cast a glimmering light. An outer shade of clear, water glass adds rich texture and playful reflections from a central etched glass diffuser. Unique stem-hung construction carries the clean line all the way to the ceiling and, for sloped ceilings, 6 in. chain is provided to allow the fixture to hang straight and level. The Dazzle collection is sure to add some wow factor to your home. Dazzling glass features a gleaming polished exterior and a interior finish composed of fused glass beads to provide diffusion and sparkle. A jewel-like, faux rock crystal adds even more panache for an elegant and well dressed effect to your home. Invite Collection 1-Light Brushed Nickel Mini-Pendant Invite provides a welcoming silhouette with a unique shade comprised of an inner glass globe encircled by a translucent sheer Mylar shade. The rich, layering effect creates a dreamy look that is both elegant and modern. Offered as a complete collection, the Invite styling can be carried throughout your home or as a focal style in a special room. Invite Collection 1-Light Brushed Nickel Mini-Pendant is rated 1.0 out of 5 by 1. Rated 1 out of 5 by Theresa from It was very chunky & looked ugly in person. ... It was very chunky & looked ugly in person.